Parlay is an entertaining card game for those who enjoy the challenge of word games and the excitement of poker! The cards come as a standard, 52 count, poker-sized deck which are unique and artistically stylized. Each card contains a letter and number value (for the letter only - much like the concept in Scrabble) inscribed on the sides of the card, below the number value of the card itself. The number values for the letters are determined by how arduous they are for use in words (for example, X is worth more points than an A). Players can play a variety of poker games, such as Quick Draw, Wild I's, Omaha Hold' Em, or Texas Hold' Em, and although players do not place bets, they must decide wether to fold or stay with each hand. The challenge in this game is to gather as many points as possible by using a combination of word points and poker hand points. The first player to score 500 points wins the game. Parlay also introduces the concept of "Wordbluffing", where players are invited to play oddly-spelled words to trick their opponents into calling their bluff to knock them out of the hand. Players can also try to get away with fake or misspelled words, hoping their bluff won't be called. Wordbluffing adds a whole new element of strategy to the game. Parlay combines the creative challenge of a word game with the fast pace, suspense, and variety of poker. Game play includes an element of risk and bluff, but no wagering is required and no players are eliminated, which makes Parlay a very family-friendly way to play poker. Parlay won Games Magazine's Best Word Game award in 2007, and About Board Game's #1 Card Game award in 2006, and has been well-reviewed by respected publications such as BoardGameNews, RPG.net, Family Review Center, and Knucklebones Magazine. 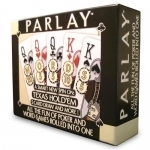 Parlay combines the creative challenge of a word game with the pace and variety of poker. Make the best word and the best poker hand that you can from your cards. Make the best word and the best poker hand that you can from your cards. You don't have to be a 'Poker Shark' or 'Dictionary Brain' to play and win Parlay. Enjoy old favorites like Texas Hold'em and Five Card Draw, or try originals like Unlucky 7's. Learn about the game from BoardGameGeek, with images, links, and discussions with fellow Parlay fans. Erik Arneson provides a detailed review of Parlay, with this summation: "Parlay is an engaging and exciting game for families, word lovers and Poker players looking for a new challenge. That's why it's my pick as the best card game of 2006." Parlay was designed by husband-and-wife team Paul and Jennifer Sturgis, who created their own company to share the new game with the world. Real Deal Games stand out for their stylish look, high production values, and fair pricing. Parlay is their first product.